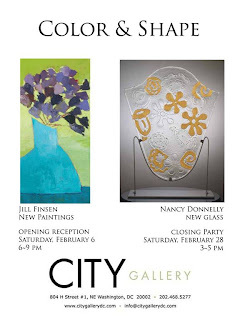 > “Color and Shape“ showcases Nancy Donnelly’s glass art and Jill Finsen’s oil paintings. Fascination with texture as a component of color and shape is apparent in the work of both these artists. Surface abstraction contributes to the success of these art pieces—the texture of the glass plays off the layered textures within the paintings. These works truly complement each other. Both artists find negative space crucial to this effect, moments of rest that energize each work and in this sense make each stronger. 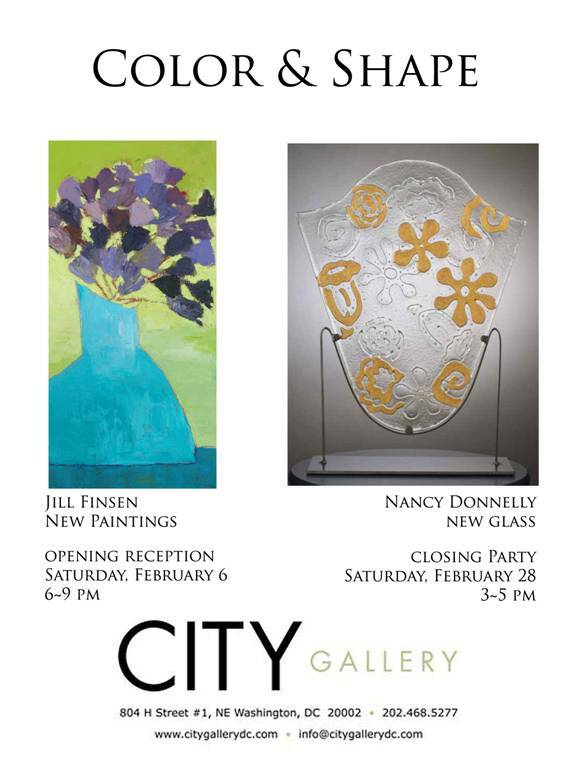 Donnelly and Finsen’s artwork provides an elegant balance between familiarity and abstraction. >This weekend was the annual auction at California’s Bay Area Glass Institute (BAGI – a nonprofit organization dedicated to supporting and educating glass artists, students and the community). Lots of beautiful and provocative works of art were auctioned, raising over $110,000 to benefit the school. 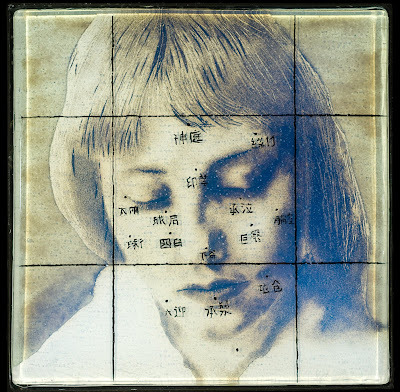 The judges chose the best piece in the auction, and three other Jurors’ Choice Awards. 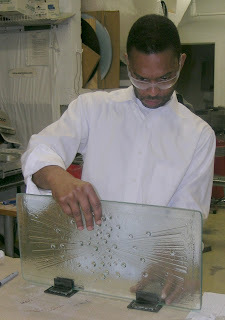 The criteria for these awards were uniqueness and creativity within the world of glass as well as for the individual artist, technical mastery, and content beyond mere technical beauty or mastery. Awards were given, and the top prize, the Saxe Award went to Michael Janis for his piece ‘Meridians’. The Saxe Fellowship Award, named after world-renowned collectors George and Dorothy Saxe, is chosen by a jury of Dorothy Saxe, Maurine Littleton, Director of the Maurine Littleton Gallery, and Micaela Von Zwoll, Director of the Micaela Gallery. The winner of the Saxe Fellowship will receive a cash prize and will be invited to participate in BAGI’s Visiting Artist series. Previous winners of the fellowship include Sabrina Knowles and Jenny Pohlman. Congratulations to Michael and all the artists! There are still several pieces available – the full catalog is online… please call Chris Moore at 408 993-2244 to inquire about them. 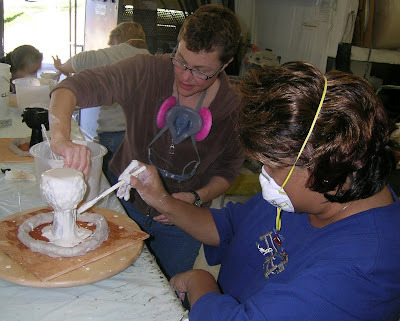 >Today was the second class with Debra Ruzinsky, where we got down and dirty with plaster and wax. It’s called lost wax, but I still see it… everywhere! 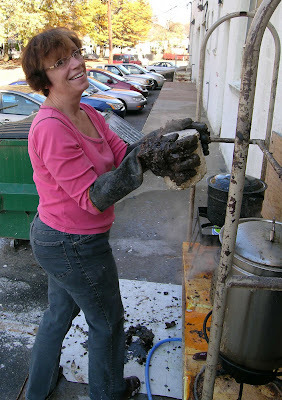 And then it all goes into the kiln. Next week we see the results. 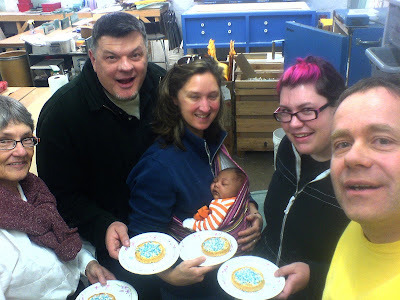 >Our lovely neighbor, Margaret Boozer from Red Dirt Studio, visited with her new baby, and we treated her to an old Dutch tradition. Nancy, Tim, Margaret, Kyle, Nicole and Erwin enjoying “beschuit met muisjes“, basically zwieback and sugar covered anise seeds with plenty of butter to hold it all together. 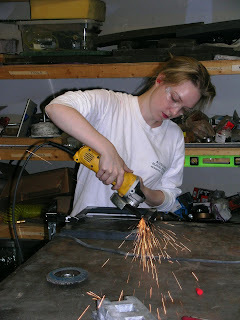 Glass and Steel Sculptural Development class show tonight! 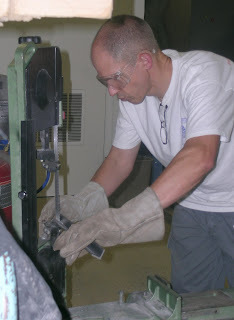 If you look carefully, you can see our TA Dave scratching his head. The kiln was loaded today for Erwin’s commissioned piece. The previously mentioned Happy Meal toy heads were used to form a sea of faces.